It'll be almost time to catch my breath, right after this issue in fact, since I'm no longer behind schedule, although there is the matter of an extra special Oink! but I'll mention that at the end. 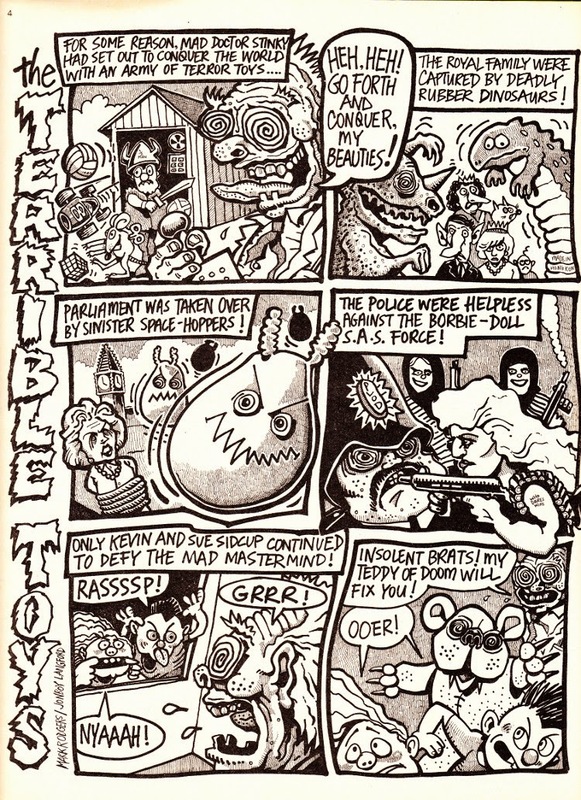 In the meantime here's the toys and hobbies issue and of course that instantly conjures up images of scientific experiments, voodoo and torture. Or at least it does if you're Hadrian Vile or his artist Ian Jackson by the looks of it. But what's this? 35p? "Thirty-five!? How dare they?!" 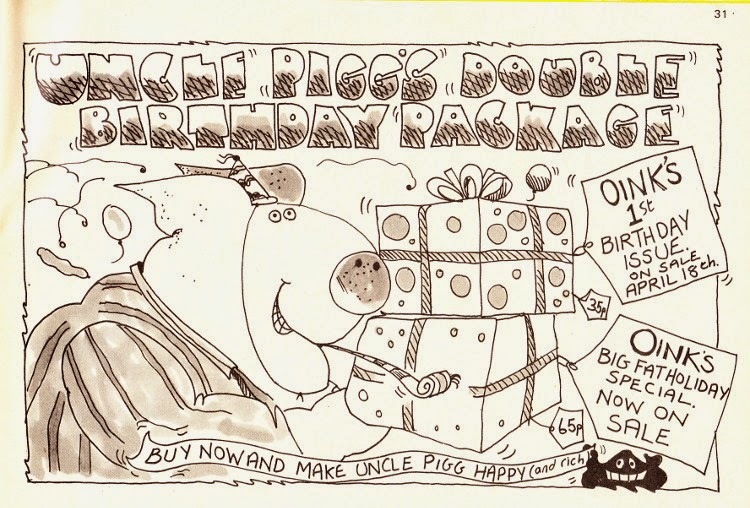 Yup, it had to happen eventually and now, one fortnight away from the 1st anniversary edition Oink! 's had to make the jump and take its first price increase. It's strange to look back now at how different titles were priced. When Oink! was released it was 30p, yet its stablemates Buster and Whizzer & Chips at IPC Magazines were only 24p, then when the price went up 5p with the pigs, the others only went up 2p. 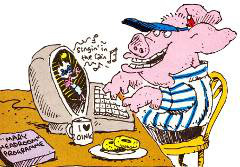 I remember by the time Oink! folded at the end of the following year Buster was still only 28p. Was it because Oink! was independently made? Was it the glossy paper? Or simply what was worked out by all involved? Looking back I remember every time a new comic would launch it'd be a few pence more expensive. When Marvel's The Real Ghostbusters came out it was more expensive than their Transformers, even though both were the same size and shape, while Thomas the Tank Engine & Friends from Marvel was also more expensive yet had less pages. Maybe it was simply easier to introduce slightly higher prices with new titles than to increase the current ones by that amount. Or maybe, as I said, each title had its expenses, target audience, projected figures etc. worked out by everyone. Who knows? My mum definitely wanted to know why every time they went up. We were kids! Of course we found it funny! 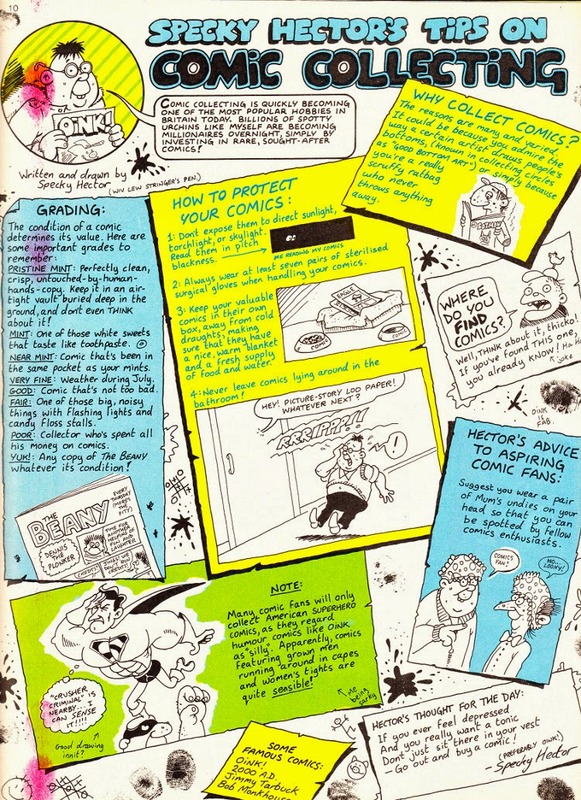 Fatty Farmer (original tagline: "He's a whole lot calmer") had been introduced in the kinda-relaunch issue #15 when a raft of newbie characters were with us for the first time. But don't for one minute think this was a cruel strip where the comic took the mickey out of his being overweight. On the contrary, he'd use his figure to win battles over bullies or, like above, just to have a good time for example. A miniature feel-good strip and a nice addition. Though if he ever did any actual farming we never saw it. And actually that's not the scariest Santa Claus you'll see on the blog, trust me! We settled back down into more familiar territory after this with Mr Big Nose, Harry the Head presenting cut-out pieces to make your own balloon Harry and Hadrian Vile telling us about his favourite pastimes: slug racing, "bilding a howme-mayde volkaynoe", making disgusting sandwiches and hiding his dad's slipper. Wonder what certain groups these days would make of a comic making fun of parents smacking their children? 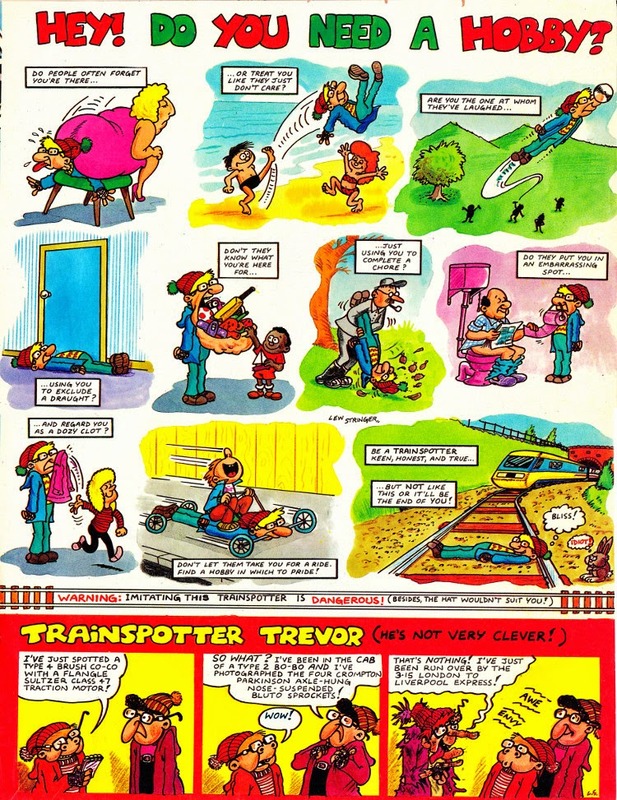 Oh and in case you're wondering, the "fantastic cut-out zeo-trope" is a Frank Sidebottom page where you could create your own animated Frank, one of those round toys with slots in them that when you spin it all the images inside look like they're moving. Add in the Harry the Head stuff and a cut-out stage and puppets and there wouldn't be much of this issue left if you actually created these things! About a decade ago I was a train conductor and in my 4 years there I saw many a trainspotter and appeared in I-don't-know-how-many home videos and photographs as my trains arrived or left stations (when I first began we still had the manually opening doors where we needed to have our heads out the window at such times), never mind when I was the guard on a steam special! They weren't quite as bad as our protagonist above, but I have a feeling one or two were only ever a few coffees away from it. Nice to see Ian Hislop make a special celebrity appearance there as Wayne, or is that just me? 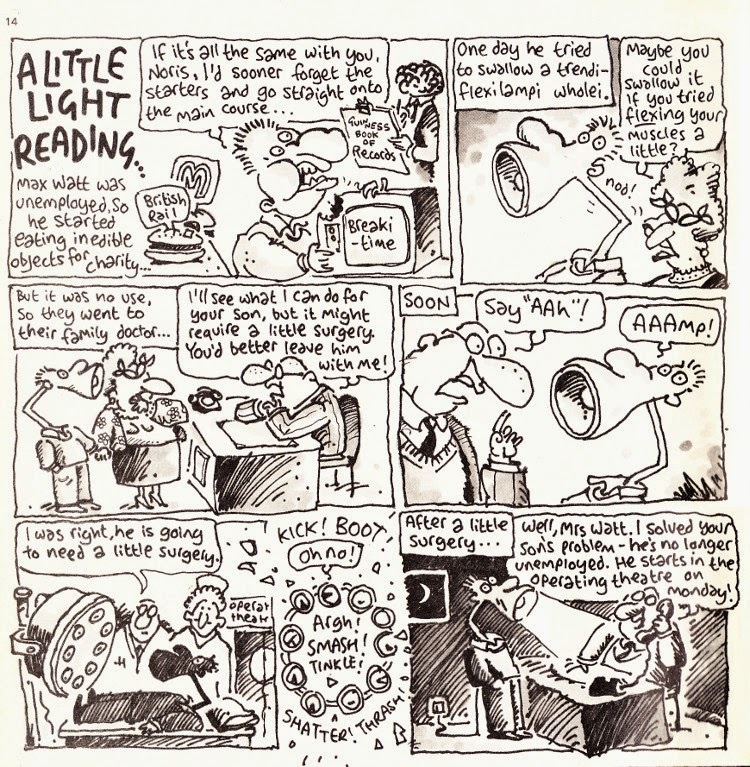 No particular Fred strips spring to mind from the time of publication all those years ago but I look forward to rediscovering them again, after all the character has to have stayed with me all these years for some reason. Well then that's us again. It's great to finally give you an issue on the actual date it hit our newsstands 27 years ago, after all that was the whole point of this when I first started a year ago. Yes, a whole year almost. And it's this special anniversary which we'll be celebrating with the next issue which goes on sale Friday 18th April. So while it's a full fortnight once more until the next regular issue, look out for the first of two posts for the special before then. After all, it is a big fat pig of a comic so one post just wouldn't do it justice. See you back here soon (again). I think you're right about the paper quality having an impact on the price, Phil. 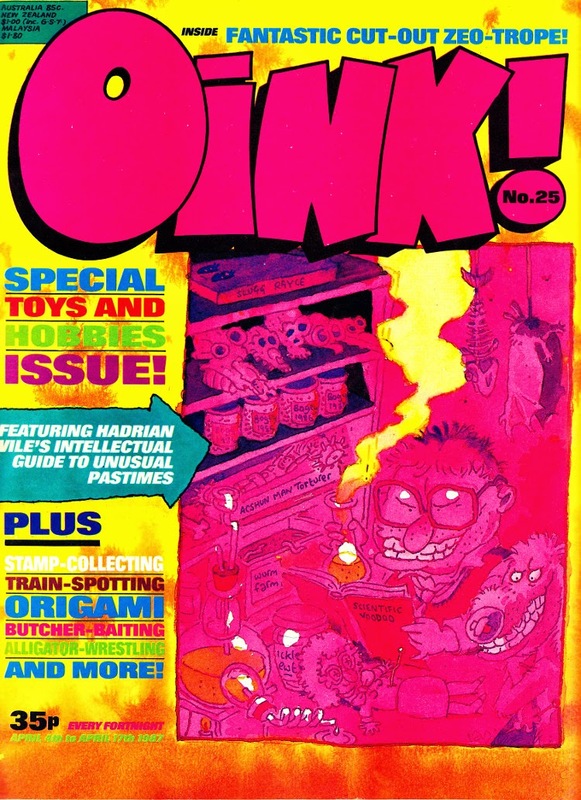 Oink was glossier and more colourful than other IPC humour comics so unfortunately it meant a higher price. I'm sure being a fortnightly played a part too, as IPC and newsagents would want a higher return for it being on sale for 14 days. Thanks for showing my pages again. Again, I'd forgotten the hobbies one, but I remember now that I really enjoyed doing that. Mark Rodgers suggested the advisory at the end. I added the bit about the hat not suiting them. 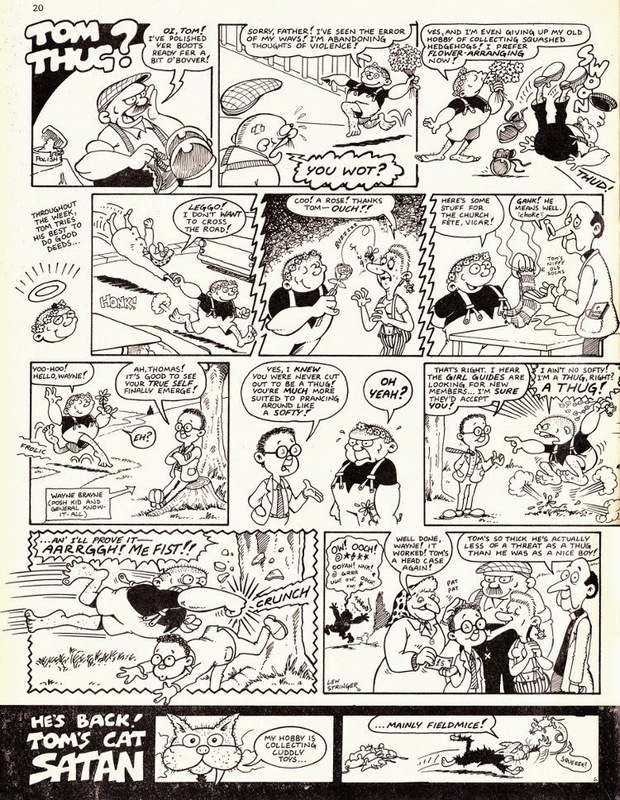 I'd also forgotten that Specky Hector originated in Oink until you showed these pages recently. So that's a fourth Oink character who transferred over to Buster, albeit on a very infrequent basis. I love that Tom Thug strip. 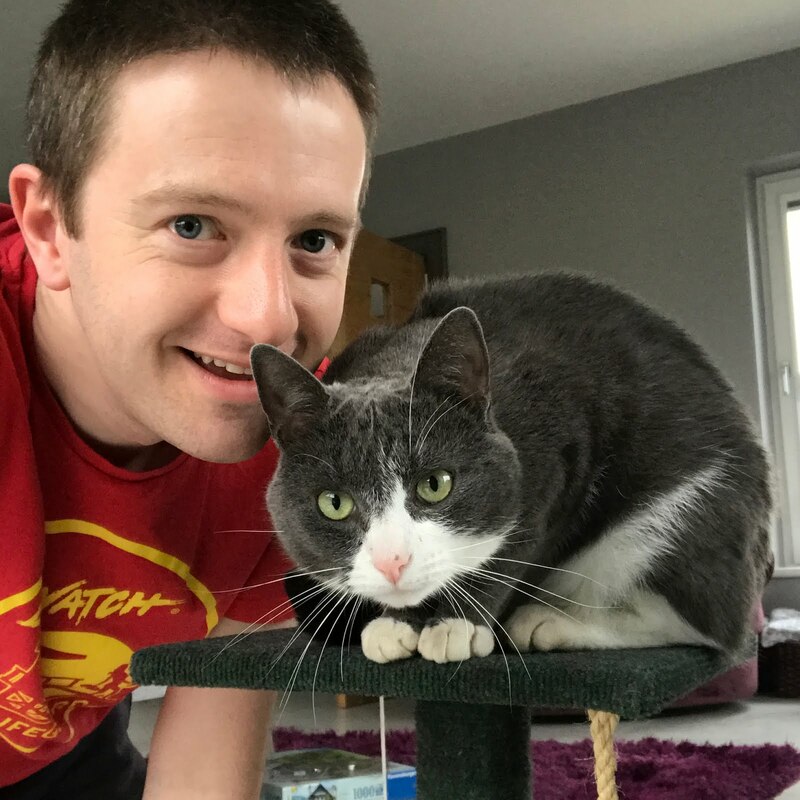 It's great to see Tom in full 1980s-Walter-the-Softy mode! Never even considered the fact it was fortnightly being an issue which could determine price, Lew. Makes perfect sense obviously, and I've mentioned it before in the blog about the paper and people reading it now must think I'm crazy. But it really was that different to what we were used to! One of these days maybe I should go through the Oink!s and send you all the one-off strips you did, your body of work is so huge no wonder you've forgotten some of them! Hi Paul, it's a brilliant example of the Tom strip isn't it? You can thank you man above! Don't put yourself to the trouble of doing that Phil. I have all my Oink's in a box nearby. It's just that I haven't looked through them in years, which is why at I forget the one off strips.